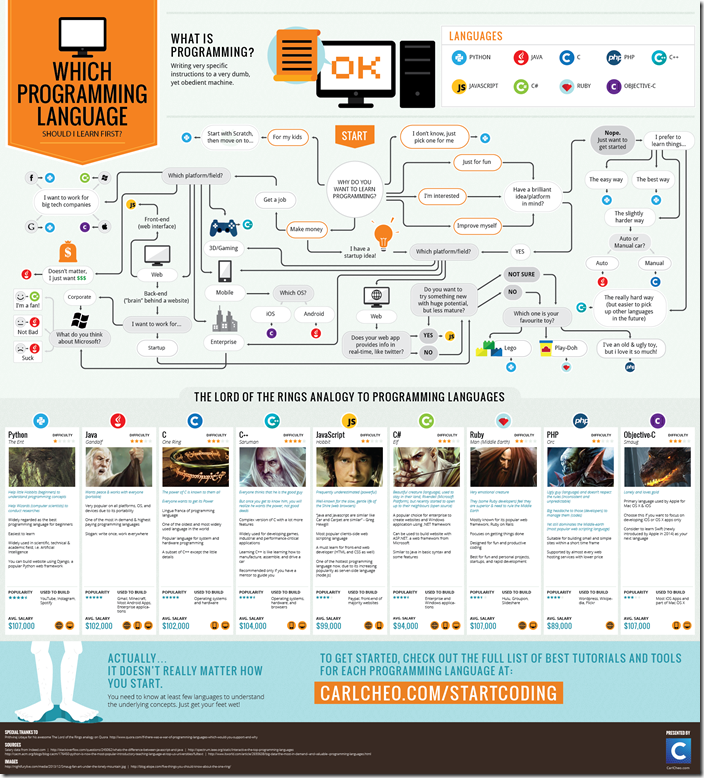 Posted byJohn Walker	 April 20, 2015 Leave a comment on Infographic: Which Programming Language Should I Learn First? The following was on Carl Cheo’s site and included here in the event it moves. Please respect the author and look at the original site and all the material there. I have also compiled a list of best programming tools and resources for each programming language, to help you get started quickly. Special thanks to Prithviraj Udaya for allowing me to use his awesome The Lord of the Rings analogy on Quora. Note: A good programmer must know at least a few programming languages to learn different ways to approach problems. They continue to learn and grow as technology advances. This is just the beginning of your programming journey. Simply pick one and start coding now!